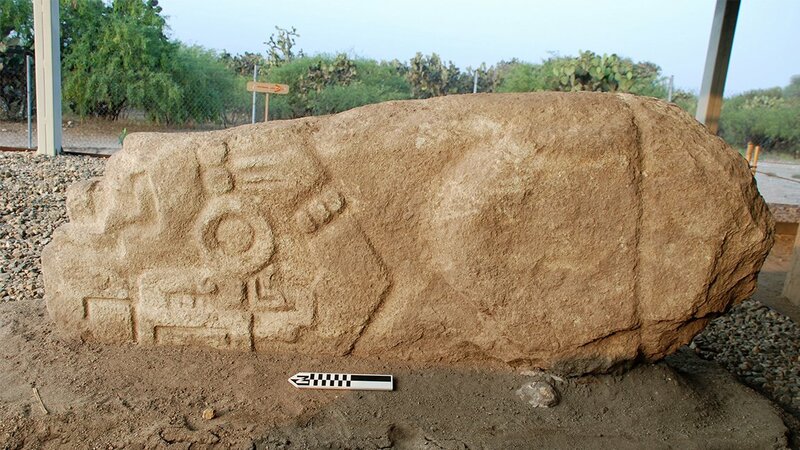 A stone carved in the shape of a crocodile was unearthed by Field Museum archaeologists earlier this year at the site of an ancient city in Mexico, the museum announced this week. Field Museum archaeologists Gary Feinman and Linda Nicholas led the excavation team at Lambityeco, a city in the Oaxaca Valley of southern Mexico that’s believed to have been populated from A.D. 500 to 850. Feinman said items found near the stone, which is about 5 and 1/2-feet long and 2 and 1/2-feet tall, indicate it may have once been used for ritualistic purposes. “We found charcoal, broken pieces of human skull and some ceramic vessels that were usually used for burning incense,” he said. More significantly, the stone is helping researchers learn how the population at Lambityeco may have splintered from a neighboring community. Archaeologists speculate that for Lambityeco’s first 200 or 250 years, its indigenous population closely mirrored the society of Monte Alban, a much larger urban center that predated Lambityeco by several centuries and eventually existed simultaneously with it. Buildings at Lambityeco were oriented in a style very similar to those of Monte Alban, but evidence suggests that around A.D. 700 or 750, the people of Lambityeco began differentiating themselves from their neighbors. Researchers believe the stone, which was found was found upside-down, was originally part of a stairway that was removed during a key period in the city’s history. The researchers also uncovered frescos similar to those found in Monte Alban that they believe were deliberately covered over by the people of Lambityeco. Feinman hopes the stone's discovery will shed light on the city’s apparent break from Monte Alban. Monte Alban was founded around 500 B.C. and is one of the oldest cities in Mesoamerica, a region that includes Mexico and parts of Central America where societies developed before Spanish exploration and conquest in the 15th and 16th centuries. Both Monte Alban and Lambityeco seemed to have tapered off around the same time. Judging by the artifacts discovered at the sites of both ancient civilizations, Feinman doesn’t think they fell by way of a natural disaster or other rapid event. “It seems to have been more of a slow, whimpering decline,” he said. For four years, the Field Museum archaeologists have been excavating at Lambityeco with Mexico’s National Institute of Anthropology and History. Each year, Feinman and his team provide their findings to petition the Mexican government to return to the site. Feinman hopes his team will be back next year but said they must “play it by ear” until they get the green light. April 25: The Field Museum recently captured some unusual animal portraits with motion-activated cameras in the Peruvian Amazon rain forest. March 17: One of the greatest archaeological finds of the 20th century comes to Chicago: ancient soldiers from an army of Chinese terra-cotta warriors. July 29, 2015: High-end treasures in Chicago's Gold Coast are usually found in pricey stores. But we'll tell you about some being uncovered at an archaeological dig on the grounds of a famous house.